Raco Non-metallic extra-duty 1-Gang while-in-use cover in white color, is suitable for using with weather-proof device box. Rectangular cover features polycarbonate construction. It comes in 16-in-1 standard configuration. This vertical/horizontal mountable cover measures 4.18-Inch x 2.75-Inch x 5.9-Inch. It incorporates patented Quick-Fit™ keyhole mounting system that allows installation in under a minute. 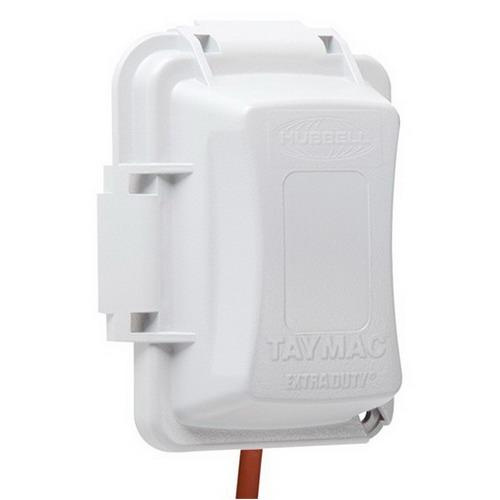 Cover is ideal for using whenever there is a requirement of weather-proof protection while an outlet is in use. Cover is UL listed, NEC 2014 compliant and meets NEMA 3R standards.